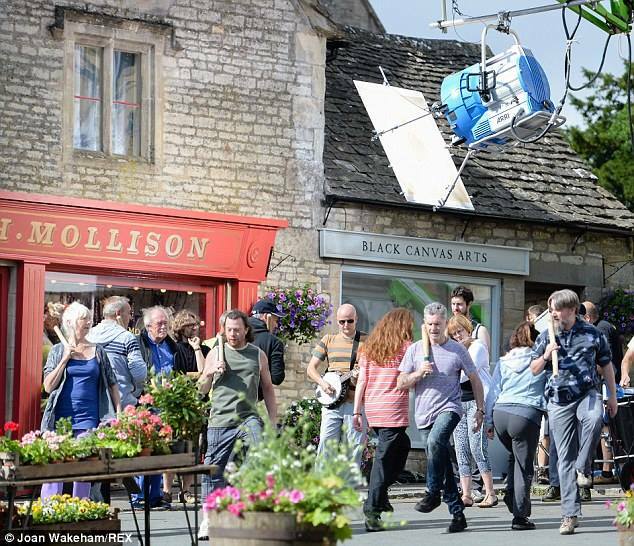 In the Summer of 2013 Styx of Stroud spent a day in Northleach being filmed to appear in the BBC adaptation of J.K. Rowling’s The Casual Vacancy. This came about after director Jonny Campbell spotted us dancing at the Butcher’s Arms in Sheepscombe and was very taken by the Border style of dancing and decided to have us written into the plot. The producers were concerned about the copyright of our music, so that all had to be checked, which was an education in itself. For example, one of our dances is to ‘Lord of the Dance’, which we thought was an American folk tune. Not so – it is based on an old American tune, but the version we all know is firmly copyrighted to Stainer and Bell. In the end we settled on a fairly safe ‘Not for Joe’ and ‘Click Go the Shears’, an Australian folk tune (except it isn’t; apparently it’s an American Civil War tune later appropriated by the Aussies – who knew!?). We were asked to present ourselves at a location in Northleach, Gloucestershire, at 6am, where we were transformed by the costume and make-up departments into stereotypes of inhabitants of a run-down council estate, the bugbear of the snobbish Howard Mollison (played by Michael Gambon). Fake tattoos were applied to knuckles, fake gold jewellery was liberally distributed, and one member of the side was even given a (fake!) black eye. We wanted to have a quick warm-up with a few dances before filming, so we got to work with our characteristic Border whooping, drumming and music. And then the door of the nearest trailer opened, and out stepped actor Sir Michael Gambon in his pyjamas. After a moment’s panic over disrupting the sleep of a National Treasure, we were reassured when Michael said he’d heard our music and wanted to watch us; in fact he was very encouraging and was happy to have his photo taken with us. It turned out that Michael Gambon’s pyjamas were in fact his costume for the day, and that our alter egos were to figure in his character’s nightmare in the morning’s filming. In his dream, threatening figures walk towards his shop, wielding big sticks, and then start dancing, while inside his shop he is visited by a ghost. We were filmed dancing Dilwyn from all angles, with and without music and with just drumming, and from inside and outside the shop and as reflections in the shop window. This part of the filming took a couple of hours, and we probably repeated Dilwyn at least eight times before the crew were satisfied that they’d got everything they needed. 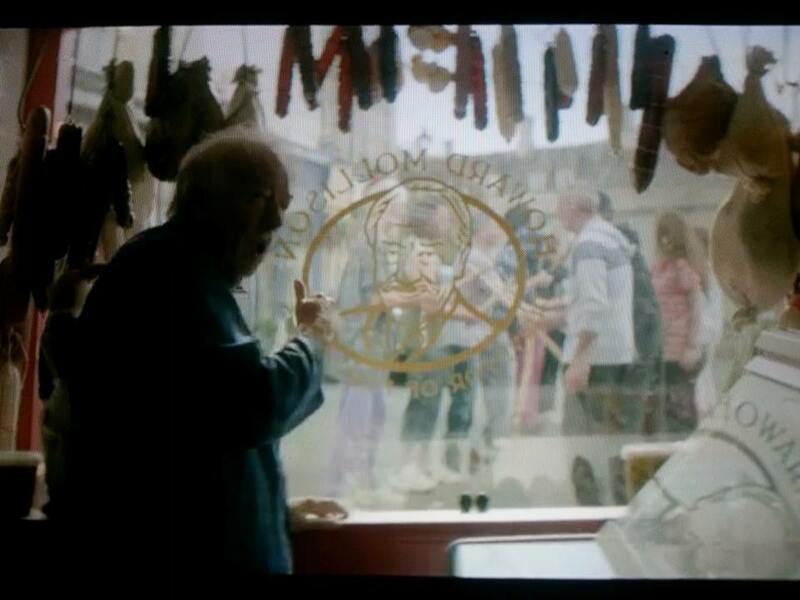 In the finished programme, however, were were on-screen for this sequence for about a minute, seen just as hazy figures through the shop window, with no audible music or drumming. … and how we appeared in the finished dream sequence. In the afternoon we returned as Styx of Stroud, dancing in the fictional village’s market square, while a row erupted between two other main characters. We were thoroughly vetted by the costume department first, and made to remove all our badges that we’d collected over our first season of dancing out with other sides – product placement, apparently! Preparing for the afternoon’s shoot. The whole process was fascinating, with numerous takes filming us from different angles, from inside a shop, and even in the reflection of a shop window. As well as being filmed dancing to music, our drummers were recorded separately, then the dancers were filmed dancing in silence while the musicians mimed. And the continuity women swooped down on us the minute they spotted someone tucking their hair behind an ear or putting on sunglasses, while the make-up artists were at hand with sun cream at midday when the sun was blazing down. We finally finished filming at about 8pm, any myths about the glamour of working in television dispelled, and full of relief to hear the words that indicated the end of the working day: ‘It’s a wrap. Thank you everyone!’ But it was a fantastic experience, and one we’ll never forget. We had to wait about six months before the series was broadcast on television, but were really excited at the prospect of seeing Styx of Stroud Border Morris on television. However, the market square scene was cut drastically, although we could still be seen and heard, just in a slightly different context and for only a few seconds. Our brief moment of fame can be seen here.